Last week I had the opportunity to attend the 2nd annual Kneading Conference West, which happened to be right here in Mount Vernon at the WSU Research and Extension Center. I was thrilled to get a press pass for it, as the conference sold out some time ago. This is an amazing event! The remarkable thing about this conference was how happy everyone was. It was more like a music festival than a professional conference. Everyone there was equally obsessed with bread and grains and ready to talk with everyone else about it. The first keynote speech was from one of my very favorite cookbook authors, Naomi Duguid. She talked about the history of bread and grain in human culture and the watering down of industrial flours. She compared commercial flour to making a wine out of all the tail ends of bottles after a party, which I thought was a particularly fine metaphor, and challenged everyone in the room to go home and start baking with different grains. A panel on whole grains started with a discussion on nutrition and source disclosure, then wandered into the issue of phytic acid, which makes bread less digestible and its nutrients less available, but can be neutralized through long fermentation, then devolved sharply at the end into a discussion of gluten intolerance. This was obviously a conversation that could have gone on for hours. Or days. Conflicting classes in the second half of the afternoon included a heritage grain tasting, bagels in the wood-fired oven, home-grown grains, and a pies, galettes and tatins workshop. I wandered around between them, but many people had trouble choosing. So many things to learn! The grain tasting seemed really interesting, with crackers baked from individual varieties, but the room was crammed full of people and there didn’t seem to be quite enough samples to go around. I’d love the opportunity to do something like this in a more intimate setting, it could be really fun. I wandered into the bagel workshop just in time to be handed a warm Montreal-style bagel coated with toasty sesame seeds. Mark Doxtader, who was teaching the class, makes these for the Portland Saturday Market. I may have to get back to making bagels myself, now that I’ve been reminded how good they are – it’s hard to get a fresh bagel around here. The test kitchen was so crowded barely a glimpse of pie was visible, glimmering with fresh peaches from the test orchard. Fortunately the pies made an appearance at dinner, later that day. Before dinner all the attendees were treated to a tasting of Gothberg Farm goat cheese along with crackers from Dawn of Evelyn’s Crackers based in Toronto, plus samples of beer from Skagit Malting. The beers are made to showcase different malts and are not available for sale at this time, unfortunately. All meals were provided with the conference and ranged from pizza baked on-site, tamales, quesadillas made with chard and beets, more hot fresh bagels with cream cheese and lox, barbecue, bread and desserts left over from various workshops, and lots of goodies from the Breadfarm. Not to mention all the samples that were being passed around. I ate so much bread I wasn’t sure I’d be able to manage another carb for a week after. The keynote on the second day was delivered by Andrew Whitley, of the organization Bread Matters in Scotland. He spoke about how the idea of what bread should be like has changed, from something changeable and interesting to something utterly predictable, a bland backdrop for other foods. His work is to educate people about nutrition and taste in real bread. He’s a great speaker and I intend to track down a copy of his book. A workshop on flatbreads with Naomi Duguid covered a wide range of recipes, including Afghan naan, banana flatbreads from Burma, and a Finnish barley bread. 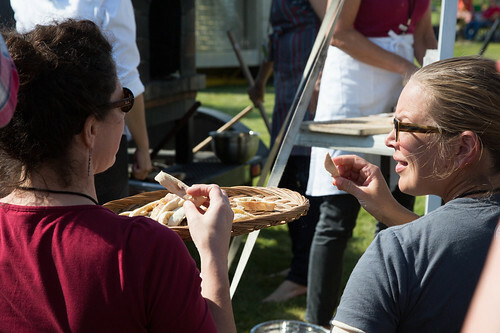 As each bread came out of the wood fired oven, it was cut into small pieces and passed around the audience. When a basket of naan failed to reach the back row a small riot broke out, one of the only times during the conference that good cheer threatened to fail. I stopped by the brewing tent too late for anything but some mash scooping. Oh, well. I’m really excited to hear about what Skagit Malting is up to, though, and look forward to hearing more about their work. While all these other workshops were going on, a small and dedicated group was working with Kiko Denzer to build an earth oven. Working with mud, water, sand, wood and straw, they looked like they were having a total blast. This was a little model oven that Kiko made as part of a quick orientation to mud oven building. It’s built onto a garbage can lid, to give you an idea of scale. By the end of the conference the oven was as yet unfired, but complete and beautifully decorated with leaf patterns. A silent auction during lunch on the last day resulted in its new owner frantically wondering how to move the oven to Utah. An orchard tour on Saturday morning turned out to be a great introduction to all the varieties of fruit that can be grown in Western Washington. Our guides showed us different varieties of treefruit, grapes, berries and kiwi, talked about their disease resistance and pests, picked some different plums for us to taste (the Mirabelle plum knocked one woman into a swoon), and answered questions about cultivation and pruning. Scott Mangold of the Breadfarm taught a class on testing different wheats and grains in bread. He does a lot of testing of the wheats being developed at the Extension, so this is definitely something he’s had some practice at. The last panel I attended was on infrastructure and the relationships between growers, millers, bakers and customers. The panelists included a farmer/miller, a baker, a caterer and an extension agent who works with local wheat farmers. They had plenty to say, but so did the audience, and the gathering quickly turned into an animated general discussion. The focus of the discussion was the difficulty of creating an infrastructure from scratch, and changing methods of farming and supply in midstream. In Skagit Valley, there has been so little grain industry that there are no longer grain storage sites. The difference between selling an entire harvest at once to a major company and holding onto grain and sending it out gradually to smaller customers can be difficult shift for a farmer. Thank you so much for all the details. I felt like I was there. Well, almost. It all sounds so intriguing and delicious. I enjoyed this and of course your other posts to food on the Brain.